As we discussed in my previous paper on this subject, the secret to making the best chicken in the world is Piri Piri. If you don’t know by now, Piri Piri sauce is to Portuguese Chicken what Cagney is to Lacey. B1 is to B2. The Tardis is to Doctor Who. Without a great Piri Piri, chicken is just chicken. It has no mojo. The origins of the sauce come from Angola and Mozambique, who both have ancient versions of chilli sauce and who customarily use chillies in their cooking. You could almost say that chilli occurs no where else in Portuguese cooking, at least only as an exotic ingredient and certainly not in any other national, fundamental dish. In trying to crack the recipe par excellence I’ve gone to neighbours, to friends, their parents and grandparents, to restaurants and to the internet. All recipes for Molho Piri Piri have as their basis malagueta chillies, olive oil and whisky. The most common variations are using a different alcohol or vinegar, and adding lemon, garlic, bay and other spices. I’ve tried a few now and I was happy with my own lemony brew which I shared before. But now I have turned to the master (or mistress if you prefer), Elvira, and it is her recipe which I will declare the perfect piri piri sauce. It is just goddam delish. Not too hot, thick enough to stick, and mighty tasty. Note however that Elvira refers to her chillies as piri-piris, and most other recipes refer to malaguetas as the variety to use for this sauce, so here I have specified malaguetas too. I’ve had too many different explanations about whether malaguetas are piri piris and whether or not piri piri is just the correct translation of the english word chilli, which we spell in a variety of ways further illustrating the elasticity of language. Blah-de-blah-blah. Maybe Elvira herself will drop by and give us the final word on this piri piri / malagueta lingistic phenomenon. Ditto Isabel. wine glass of either balsamic vinegar, port, brandy or scotch. Even in this situation I will still only use recipes as a guide. Not because I don’t think Elvira’s is perfect, but because I know how I like it. I can never see the point in only one clove of garlic, for example. I used three. My lemon zest seemed a bit skimpy so I added some more, and I chose a nice bottle of scotch for the punch, giving a small glass to the sauce and the rest to me. But one day I will try the balsamic version. Balsamic & chicken sounds wild and amazing. You put all the ingredients into a blender or a food processor or a bamix thingy and grind it up until it looks good. I marinated my chicken in it for a few hours before barbequing. Super seriously yummo, and it also makes a boring pork chop very worthy. I will try to help with the understanding of Piri-Piri, and add more ‘Blahh’ to the ‘Hahhh’ 😉 (I know it is a little demanding to play with quasi-words this way, I’m trying to be funny here). 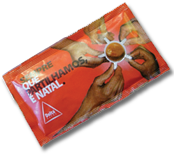 I would like to say that Piri-piri relates to ‘malagueta’ as football to the player. So P-P is the taste or sauce or the idea of the heat – where malageta is the core ingredient from where all Piri-piri necessarily must come from, (there wouldn’t be any soccer without players, would it?). So strongly related are they, that you often refer the malagueta fruit or seed alone, as Piri-Piri. that´s excellent helder – you turned the Blah into A-Ha! The piri piri is the malagueta´s mojo! Viva! I dont know if I´ll ever go back to normal chicken now!And so good with a vinho verde on a hot summer´s night! cheers! @sophie, well I found the malaguetas very hard to get… not at markets, not in the supers neither… but I eventuualy found this plant in Avelar “plantas viveiros” (like what else? a shop called dead plants?) mercifully laden with fruit and labeled MALAGUETA. They are not very hot, you can happily include all the seeds and not blow your head off. (i even licked my fingers after chopping them as a test – I couldnt do that with the little ones. The tiny ones will work, but I´d leave out the seeds and double the azeite and lemon zest. And yeah, I´ve found little ones called piri-piri too… but now with helder´s explanation I know it refers to their bang! If you still are able to lick your fingers after chopping them, then they are not worthy to be named Piri-piri! From my recollection, here, only the strongest ones qualify. Buy the strongest ones, wash, dry and put in any small glass jar drained in olive oil. You only need a few drops of this oil for your cooking and refill it regularly with new oil and/or malaguetas – will last for years! 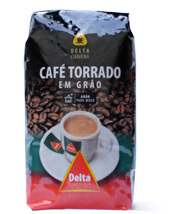 And you can regulate the strength of the mojo (molho/pt) by time and refillment. 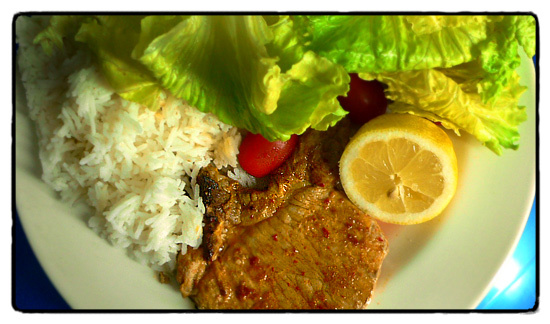 When the strength is correct, use one teaspon of the oil for marinades or/and a very small droplet for your full plate. The malaguetas may stay in the jar for ages. now a chilli oil can be a dangerous thing! One drop too much and you´re away! I´m not saying the malaguetas aren´t hot, but I used to eat chilli straight from the pot once, so I´m just saying they are not the hottest. What I like about them is you cant go too wrong with how much you use of the sauce… you can slap it around with some abandon… and we like that. @Emma, Makes sense – You are so right! Hello Emma, nice article, but a little commet. 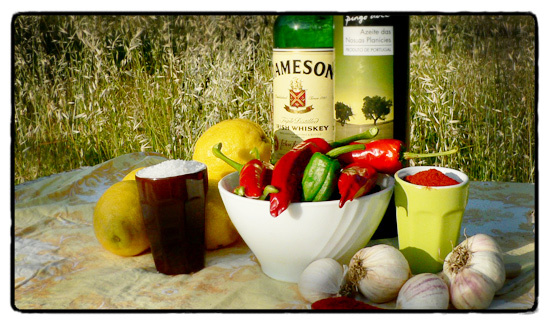 If that picture is of the ingredients you used, do you realise your scotch is in reallity irish? lol, just kidding. Enjoy your “Frango com Piri-Piri”. @Emma, Also, “Whisky” only comes from Scotland and is, as you said, sometimes referred to as Scotch. “Whiskey” however, is not necessarily from Scotland. Only whiskey distilled in Scotland is allowed to be called “Whisky”, everything else is “Whiskey” with an “e”. @P.Silva, Uísque, as they still spell it in Portugal, is an old Gaelic name, I think it is as much Irish as Scottish, if not more. Who cares – 🙂 -as long as it gives You a sophisticated ‘suave’ experience? After the 4th, in my case, i can’t tell the difference and who cares hehehe. 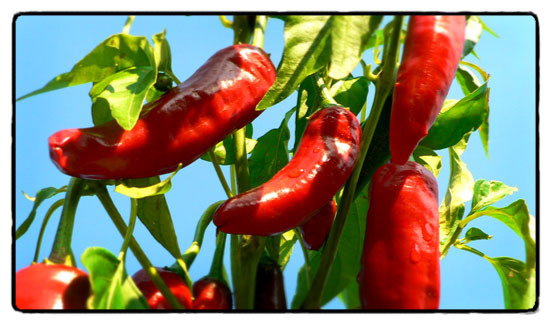 humm….real piri-piri must be made with the small and really hot chillis. But if I want to me more precise, like in saying how many of the fruits I will use in a recipe, I use the word malagueta. BTW, according to my brother who is the maker of piri-piri sauce in my family, you have to forget it in a cupboard until the malaguetas move to the bottom. Then it will be ready to use, a couple of drops at a time, of course. Now, google “scovile” and you will have entertainment for a couple of hours. Luckily I have some chicken in the fridge so I can experiment with your recipe tonight. Thanks a lot Ana. beijos. Growing up my best friend was directly from Portugal. She had moved into our little neighborhood with no English and she was adorable. The food her mother would make was to die for. And I remember the peppers in their kitchen, waiting for some creation. She would hunt everywhere for those peppers. Ended up the second summer they had their own little garden going with all that they needed for these mouthwatering dishes. One of my favorites was this cold tomato salad in an oil so light, haven’t been able to find that oil, I think I could make the salad okay but would have to find that beautiful oil. Yesterday my boss, who comes from a village near Castelo Branco, told me that gindungo (or is it jindungo?) was brought from Africa by the people that had been there during the war, or for work, and it was “smaller and hotter than malaguetas”. You could plant them and they would grow fine, but after a couple of years they would degenerate and the fruits woiud be bigger and less hot, like malaguetas. I love your site:) I can say I am addicted to hot stuff and mainly piripiri chicken, Gown up in Africa we had family cooking contest every sunday with lots of wine. I can easily say from a family of eight I have produced the best recipe, although I have never tried it with whisky or port like yrs.I have good memories of the early days in Mocambique and the best periperi chicken comung out of the most primitive kitchens. Yes chicken is not chicken unless its periperi, I have my sauce on every thing I eat even breakfast:) Living in New Zealand now I really struggle with the bland taste buds they have here, I make my sauce as a hobby and sell to friends, there is just no market here yet for hot sauce. I am gonna try yr recipe and see how it goes:) with my taste, also my daughter,has been my chief taster. This sounds like a really good version. Will add this to my list. Wonderful!! I didn’t think I could handle going another day with supermarket bought, overly salty ‘piri piri’. I think I was spoiled living in Petersham’s Little Portugal (purely by chance, Its actually completely unrelated to me living in Portugal now haha)… Petersham Charcoal Chicken’s piri piri is amazing to say the least. Cravinnnnnngs. Pingback : two of a kind - a blog about buying a ruin and building a house in Portugal plus food, architecture, design, travel and animals. Thank you for the nice recipe. The real peri peri chicken stuff can be found in southern africa like Mozambique, angola, Swaziland and southafrica. the pepper used is the african birdseye pepper or piri piri or as the english called it the little red devil. Its hot and fiery. 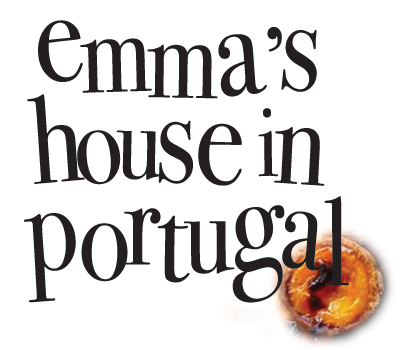 Only people who seem to cook it right are the people of portuguese origin. Regards. You know, bragging about the ‘best chicken in the world’ is a big boast. 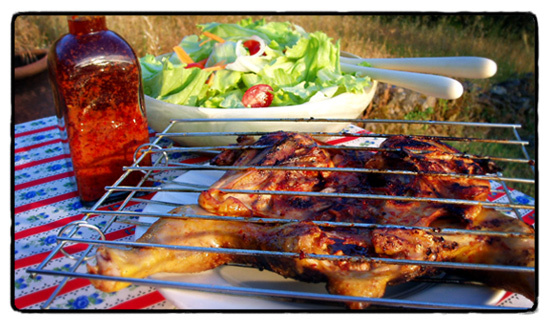 Piri Piri is lovely but there are other better rivals such as Jamaican Jerk chicken! Jamaican Jerk? Put Jamaica on the holiday location list! I was in Paris in one of the outer arrondissement and drove past an incredibly delicious smell and a bit of a line waiting outside a shop. Everywhere I have traveled I always jump in to just this sort of line and was never sorry. It turned out to be a Portuguese Piri Chicken shop where the butterflied chickens were grilled over coals and painted if you like with an extra dose of piri sauce before wrapping up. I nodded to the man with the paintbrush to lay it on while the lady of the shop shook her head in warning. Turned out to be one of my most memorable meals and have been wanting to imitate it at home ever since, even bought some pre-made Piri marinade which is nothing like what I was served that first time. So happy to have this recipe and thanks. By the way one comment was about Americans thinking mild chilis are hot. Just remember the US is a rather large place and generalizations fall short. There are Americans in the south of the country who are among the eaters of the hottest chiles in the world. That region is also home to some intensely hot sauces and native peppers. Enjoy! I have spent several winters in Mexico where whole butterflied chickens are bbqued over charcoal pits with a hot chili type sauce that is very similar to the sauce my nephew-in-law who is Portuguese uses for his chicken and shrimp. I look forward to seeing him each summer and to eating his wonderful shrimp periperi. A Mexican friend taught me how to cook chilis in oil slowly and keep it for cooking all sorts of hot and cold dishes. I find oil is the easier way to control how spicy you want the end result to be.